Easy hook-and-loop straps for securely mounting to the bike. Reflective hits for additional safety. For years I carried two extra tubes in the back pocket of my jersey. Recently I decided that I wanted that pocket for other uses, and ordered a saddle bag from Silca. That one turned out to be difficult to use. I looked at Western Bikeworks catalog and found this one. When it arrived I found it very easy to attach to the bike, large enough to hold two tubes, either sized for my road bike (25MM) or my gravel bike (32MM). I could also fit two CO2 cartridges and a patch kit in the the bag. I quickly realized it was well worth it to have one for each bike and bought a second one. It fits snugly under my Specialized Power seat, has reflective material on the back (you can't have too much of that! ), and has been very easy to use when I have gotten flats on the road and needed to get to my extra tubes or to put the damaged on inside. It has a excellent zipper system, it totally waterproof, and pretty unobtrusive when secured below the seat. It is exactly what I wanted in a saddle bag. If your looking for a saddle bag where weight and aerodynamics are the primary focus, this is the bag for you. It will hold all the essentials, but getting to them is a little cumbersome. With the zipper a little forward of the end of my Sella Italia SLR seat, unzipping the bag is hard and with the sharp angle it is unzipped, I sure hope the zipper is strong! The bag overall does appear to be well constructed. Because of the way it mounts, it is very stable. I do have a larger saddle bag for those excursions where rain jacket and camera are necessary, but for the rides where you just want to take levers, gel, tube and keys, this is perfect. A little smaller than I was anticipating, but ended up being the perfect size for me. I was able to fit all my required spares. (Tube, CO2, tire levers etc). Fabric material seems sturdy enough and zippers works well, attaches firmly underneath seat. No much to add in terms of longevity but initiall impression is positive. Most bags nudge the back of my legs and velcro wears a fuzzy spot on my shorts. This one doesn't. Also less rattling against bottom of the saddle. I bought this is the greenish color. It was the closest to my frame accents. It holds a tube for my 38c tires, a set of tire irons, a park multi-tool with chain tool, a CO2 and CO2 accuator. Its a little tight so getting the mulitool out can result in dropped items but it looks as good as a saddlebag can and attaches easily. 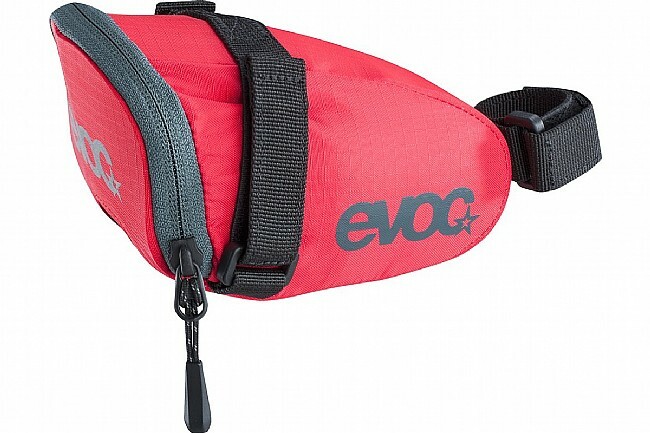 The Evoc saddle bag fits unobtrusively under my saddle, but still has enough room to pack 2 CO2 cartridges, air chuck, 2 tire levers, spare tube, and a multi-tool. This is the third Evoc saddle bag I've purchased over the past few years, and I can attest to their durability.